Don't worry about the past. It's already happened, and you can't change it. Don't worry about the future either. 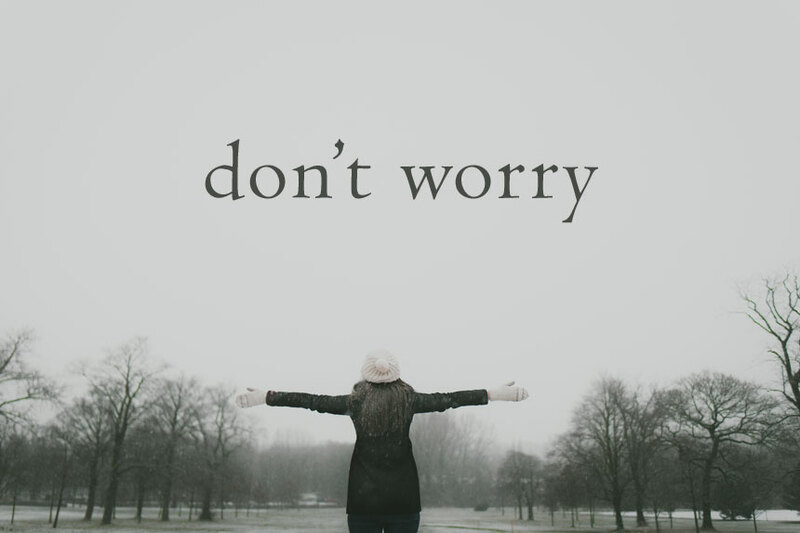 It's not here yet, so why worry about something that may or may not happen? It's a simple premise, but the message hit me like a brick. All I did was worry about things, and I realized that it was futile and harmful to do so. My concern about decisions made in the past fell away, because there was nothing I could do to alter them. My anxiety over things yet to come disappeared, because it was silly to waste my time agitated over an outcome that may/probably won't occur. Taking on this mindset has been amazing for me. I am happier, lighter, and 100% less stressed. Sometimes this frame of mind isn't as easy to take on as it seems, so I have to concentrate especially hard. When it gets difficult to step away from the past and the future, I close my eyes, breathe deeply, and concentrate on the things I'm sensing at that moment - the warmth of the blanket I am under, the sound of my husband's voice in the other room, etc. - and I slowly but surely calm down. Concentrating on things in the here and now brings me back to the present, and that strategy has worked well for me thus far. Additionally, I have made a few lifestyle changes that have made this calmer outlook on life easier. I have been working out more, and the attempt to get stronger brings me more focus. Instead of filling nearly every day of the week with social engagements, I have stepped back and lightened my schedule so that I'm not running from hangout-to-hangout nearly every day and ending up with no time for myself or Tadd (I still love you, friends and family, promise). In my down time, I have been trying to read more books and/or educational articles instead of drowning in the black hole that is social media. This one has had the least progress, but I'm working on it. As a whole, these have helped in chilling me the heck out, and I could not be more pleased. Does this all mean I'm taking a "YOLO!" approach to life? No. We cannot completely forget about the past. There are things in life that require reflection and making amends. We cannot completely go unprepared into the future. There are goals and dreams that require planning in order to succeed. My purpose is simply to be more deliberate about what things in the past and future that I give my time and concern to, because not all of it is worth losing sleep or sanity. Very true. I have always been a big worrier, but I've learned to let go of the past. The future is a little harder for me to not worry about, though. Shann, I understand! That one is more difficult for me to do, too! I'm a worrier at heart, so I have to work really hard to overcome it.